Recently, a friend/coworker of mine did a brewery tour at the Olde Saratoga Brewing Co. located in historical Saratoga Springs. It’s a brewery where they make 30 different types of beer and owned by Mendocino Brewing Company. He brought me back a growler filled with Mendocino Brewing Black Hawk Stout. It was a bit of a surprise so it had to get tasted as soon as possible. The color of the beer was that of a proper Irish Style Stout, black. No light came though. The beer had a nice cream color head to it. The smell of the beer was not that hoppy, a little of the dark chocolate and a lot of coffee coming though. The body was full but barely above average. 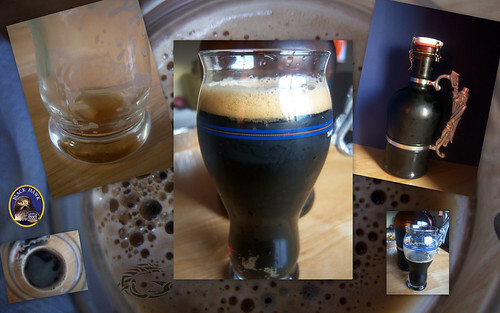 The sweetness of the Black Hawk Stout was scarcely there; this stout was more on the dry side. The whole Cascade and Cluster hops provided a nice hop spiciness to this beer leaving a slight bitterness on the back of your tongue when finished. The flavors of this stout were not too bold or original and not too impressive. The Black Hawk Stout had a nice balance to it but was not to complex. It’s an easier stout to drink, maybe a step or two above Guinness stout. The Alcohol feel of the Black Hawk Stout was a warming one. Not too strong though. This stout has an low drinkability. If I was in Saratoga I would choose it because it was local. The Beer came in a nice two liter German growler and honestly was the best part of getting this beer. This stout wouldof paired awesomely with chocolate cake or whoopee pie. A good steak and potatoes would have gone well with it also. The Comic I would read with this beer would be the current run of Amazing Spiderman, beginning with issue #546 (Jan. 2008), till the current issues. Like the comic, I would have this beer if it were there, I would not seek it out. In the end it was a decent stout, just decent. Something was missing, I just could not put my hand on it. I would like to try this on nitro or from a cask, maybe I would get more out of it then. The beer also held up really well in the growler, but I would not let it go past a week. Black Hawk Stout retains the big traditional flavors of an Irish-style stout and yet offers a refreshing dry crispness that is rare in many dark beers. “Bottle Conditioned” Black Hawk Stout is replete with a rich, roasted malt flavor that makes this not-so-heavy stout, creamy and ever so smooth. It has a subtlety that surprises and converts even the most reticent stout drinker.